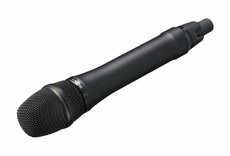 The DWM-01/F31 digital handheld incorporates a newly developed uni-directional (supercardiod) dynamic capsule and is ideally suited for vocal applications. The microphones frequency response is 60 Hz � 18 kHz with a maximum input level of 151 dBSPL. The DWM-01/F31 provides a choice of 1, 10 or 50 mW RF output. The transmitter operates for approximately five hours using two AA size alkaline batteries at 10 mW output power. Transmitter functions; including input attenuator, RF frequency selection, RF power output, Audio LCF frequency and a power sleep mode (in the transmitter) can be remotely controlled from the digital wireless receiver. Dimensions 1 7/8" x 10 1/8"